Forget you Maglite, your glowstick, and definitely your cellphone, there's a new, cooler brush for painting with light. It's called the LightScythe. 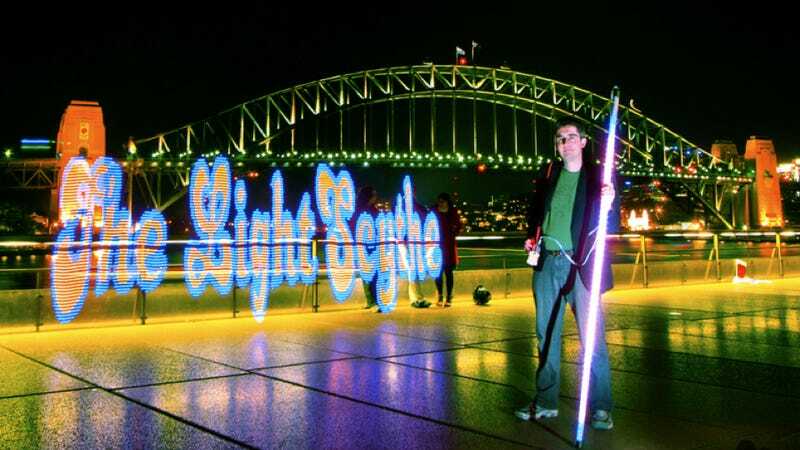 It's a long wand of computer controlled LED lights, and with it you can create some amazing images. Light-painting, for those unfamiliar, is essentially drawing with a light-source while a camera takes a long-exposure (you can see some other examples here). This is a unique take on it, though. Using a staff covered in LEDs, an arduino board or two, and a laptop, The Mechatronics Guy gets the lights to flash different colors in a controlled, pre-programmed sequence. The shutter opens, he walks along with the staff at a steady pace, and the shutter snaps closed. It wouldn't look like much to watch, but when you see the image it produces, you'll be blown away. Oh, and you can make your own.